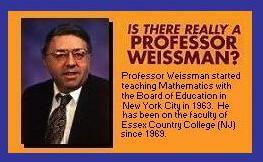 Professor Weissman has been teaching math for over 50 years so he's very passionate about helps students learn Algebra, Trig and Pre-Calculus. After all of these years of teaching he's developed a method that he feels really helps each student understand how to solve higher math problems. Yes, there are plenty of work and textbooks out there but what about illustrations that show how to solve these problems. Afters years of research and a lot of trial and error a tutorial software was developed by the name of Math 911. The Math 911 software generates problems for the students, the answers are not marked wrong but each student has to get a specific number of correct answers to prove that they have mastered that level and then they are allowed to move on. If the student doesn't understand the problems there is an area to click on for step by step instructions. Then, the student will practice until they master the subject. The suggested age range is 12 and up or anyone that is ready for Introductory to Algebra. To be completely honest this was to advanced for my 7th grader and she was very frustrated when we were trying to use it. That's my fault because I thought she was ready for Intro to Algebra but she's not quite there yet. I do think that this is a great program and would be a wonderful supplement to any curriculum that you are currently using. As I was going through the program I was wishing I had something like this when I started learning Algebra 25 years ago.